My inspiration for this post. “We are the 99%.” This slogan has become somewhat of a house hold term over the last month. It is, of course is the catch phrase of the Occupy movement that is currently spreading all over the world. Beginning in America, Occupy has spread from South Africa to Japan, to the Czech Republic to Brazil, the Occupy movement is truly a worldwide event, and since the 15th of October Occupy has made itself at home in New Zealand. According to their Facebook page, Occupy Aotearoa New Zealand exists as “…an expression of solidarity with the people occupying Wall Street as well as many of the other occupations around the world. We support the assertion that endless corporate greed compromises the political system and holds too much influence over our everyday lives. We stand for a truly democratic society of freedom, equality, justice and equity.” At first glance I was, at least in principal supportive of the Occupy Movement, but as the days and weeks have progressed I find myself less and less in support of Occupy. For me as an indigenous person, I find it very hard to reconcile the Occupy cause with that of my own people and indeed, that of native people the world over. Occupy’s slogan is largely based on the disparity between those who have the majority of the worlds wealth and their influence. It is largely regarded as fact that 1% of the world’s population control 40% of the world’s wealth, and in the eyes of Occupy that also means power. So far, so good, I have no issues with that as a basic issue that should be brought to light. My reservations come in on a more fundamental level, that being the baseline foundation of the movement and their mode of protest. My people, our people have been occupied, formally at least, since 1840 and so when a movement springs up in New Zealand proclaiming the occupation of the country until we see a return to democracy and equality, I am sure you can understand why I would be a touch hesitant to stand in solidarity with the said movement. Our people have been fighting for the last 170 odd years for our very existence as Māori. Not for financial gain or in protest at a financial deficient, no, our needs are far more fundamental than financial. We have been fighting for our language, our histories, our culture, our land. We have been fighting for our very lives. All of those things that make us who we are, we have been fighting for. As an indigenous person in Aotearoa New Zealand I feel marginalised, sidelined and ignored as a result of the Occupy Movement. At a very fundamental level, the Occupy movement is effectively an import. We imported the slogan, we imported the mode of protest, and we even imported the chants. In doing so, the organisers of Occupy Aotearoa New Zealand have introduced yet another tool of colonisation to this country. While the protesters march down Queen Street, Māori are making up more than 50% of the Prison population. While the protestors are pitching their tents in Aotea Square, over 50% of Māori are living in the 3 highest deprivation deciles. While the protestors occupy Auckland, Wellington, Christchurch and Dunedin, Māori are still fighting for rights to our Ancestral Lands. I have said it before in my blog posts and I will say it again, as Christians our calling to love and to serve means that we should be concerned with injustice in whatever form it takes and wherever it occurs. A part of that responsibility is to ensure that our response to injustice doesn’t cause more hurt and pain and therefore simply perpetuate the cycle that injustice creates. This is where I feel Occupy Aotearoa has come up short. I must confess, like I said earlier, at first I thought Occupy was great. Finally, a response to corporate greed and power, but when I looked beyond the surface and reflected on the implications of the protest, especially on indigenous people I began to realise that this protest doesn’t in fact, empower the already weak. It doesn’t liberate the marginalised or release the captives. It doesn’t restore sight to the blind or let the oppressed go free. What it does do is highlight just how off the radar and unimportant issues of justice, especially justice for Māori, is in Aotearoa New Zealand, even among those who fight for better equality and justice. Perhaps if nothing else, that realisation for me is a worthwhile outcome of the Occupy Movement. 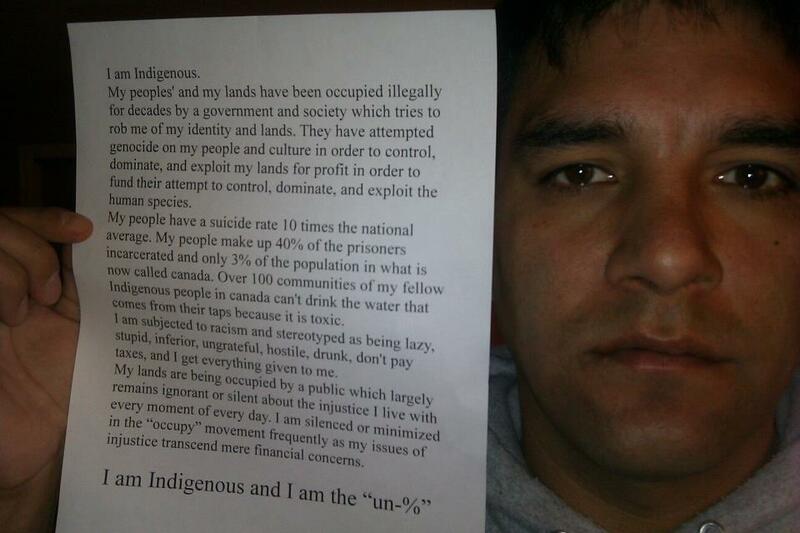 My Name is Christopher Huriwai, I am indigenous and I am the occupied.